This is THE WIZARD OF OZ - but not as you know it. 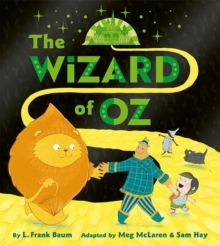 Follow Little Dot down the yellow brick road to the wonderful world of Oz in this new picture book adaptation of L.Frank Baum's much-loved story. When Little Dot's home is swept up by a tornado, she finds herself in the strange land of Oz. Dot and her little dog Toto bravely embark on a journey to the Emerald City, together with Tin Can, Scarecrow and Lion. Can Little Dot find her way safely home and help her new friends on the way? Young, preschool Dot opens this classic story up to a whole new generation and Meg McLaren's friendly, colourful artwork reimagines the Oz characters perfectly for toddlers. With a mesmerising front cover with sparkly holographic foil and an eye-popping emerald font, this is the perfect gift for young readers and Oz fans of all ages.